While fundraiser cards have been around for many years, there is still nothing that compares for PTO and PTA organizations who need to raise money. You may have tried bake sales, raffles, car washes, candy bars, catalog sales, pancake breakfasts, and on and on. Regardless of what you have done in the past, it’s doubtful that any of the products or methods you have used even come close to what it’s possible to achieve with fundraiser cards! So, what sets these cards apart from everything else? The profits are truly unbelievable. How much has your group made when selling candy bars or jerky – 50% or 60%? 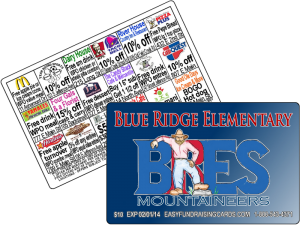 With fundraiser cards, the profit margins you enjoy depend primarily on the size of your organization, which affects the number of cards you order and sell. For instance, if you have a group of 50 who will be doing the selling, you will need to order at least 500 cards (most people easily sell 10). At this rate, you will enjoy 70% profit margins, which essentially means your organization earns $7 on every $10 card sold. A group with 200 participating in the selling would need to order about 2,000 cards, which shoots profit margins up to 102.5% – wow, that is incredible. But how can that be? With every 1,000 ordered, you get 200 cards free. Another reason this is such a profitable way to raise funds is that it is a product that customers actually want to buy, because of the value they offer. Faster sales, faster profits. You get the opportunity to promote something consumers actually want. Fundraiser cards are unique in that they allow the card bearer to save a substantial amount of money over a one-year time period on products and services they would typically spend money on regardless of whether they got a “deal.” For instance, the purchaser can enjoy a 15% discount on an oil change for the car, or a haircut/color at the local salon. What about a buy-one-get-one-free offer on a burger and shake? This is real value for ordinary people, those who spend on these types of purchases in their local community. Considering there is a minimum of a dozen special “deals” on the backs of the cards, consumers are happy to buy. Who wouldn’t be, considering the potential savings over the course of a year using a card that cost just $10? Your organization will be able to raise the amount of money you need in far less time, without a lot of planning and work. Which brings us to the next point – less planning and work! Fundraisers usually involve a ton of work and planning, but unfortunately the profits usually don’t equal all of the effort your group puts in. With fundraiser cards, there is very little planning or work involved, and a lot less worry as well considering you don’t have to worry about storage issues, melting, keeping up with catalog or cookie dough orders, etc. Simply decide on the merchants you would like to offer a “deal” for the cards, contact them with the details of your fundraiser and to secure their participation, order your cards from the card company, and you’re ready to get started when they arrive. If you don’t feel comfortable trying to solicit merchants to join in your fundraising efforts, the card company is happy to handle this for you. Once the cards have arrived, distribute them to your organization’s members and begin selling anywhere and everywhere. These are the basics of what sets PTO fundraiser cards apart from other fundraising methods; as you can see, it’s simply the easiest way to raise money today! Try it for your next fundraiser, and see if you don’t agree that this is the only way to go whether you need to raise a few hundred dollars, or several thousand.